Craft beer has transformed the drinking scene in Philly over the past decade, growing from a niche tipple to a fixture at most bars. Now, the more rarefied—or just more determined at getting drunk faster—world of craft spirits is hoping for the same luck. At least, it will if five-year-old, award-winning Philadelphia Distilling has anything to say about how you spend your Friday nights out. “It is happening, and the numbers prove it,” says Andrew Auwerda, president of Philadelphia Distilling (PD), about the growth of craft distilling. Auwerda has more than just his own belief in his business going for him, though; his company’s flagship liquor, Bluecoat gin, just won the 2009 Double Gold Medal at the San Francisco World Spirits Competition. Made with mostly organic ingredients, including the juniper berries that give gin its dry kick, Bluecoat is both homage to Philly’s revolutionary past and a very flavorful and smooth spirit. Its fragrant smell, and iconic deep blue bottle with gold lettering exude class. If you’re looking for a truly local spirit, they also feature the Penn 1681 rye vodka (the date commemorates the year when King Charles II signed the charter for the Pennsylvania colony). Made from locally-sourced organic rye, 1681 is smooth and crisp, perfect for sipping or mixing at your next green event. “We were asked by so many people to make vodka, and we think it has the most relevance to sell it in Pennsylvania, Delaware and New Jersey,” Auwerda says of their decision to only distribute the vodka locally. Pennsylvania farmers use rye as a cover crop, meaning it helps maintain good soil, among other things. So, in a way, the more shots you down, the more you help our local farmland. Everything at PD is made in small batches to preserve quality and freshness. Bluecoat is made in a unique copper still designed for the company, and Penn 1681 is distilled four times, so only the most pure elements make it into the bottle. The decision to create an absinthe (the first to be legally made in this area for over 100 years), though, speaks more to the company’s commitment to stand out in the liquor world. “We like to zig when other companies zag,” Auwerda boasts. “For Robert [Cassell, master distiller], absinthe is like a master’s degree. It’s challenging.” Another Double Gold Medal at the World Spirits Competition for their Vieux Carré absinthe shows that, for PD, it really isn’t much of a problem. (And if you like the flavors of anise and fennel—not to mention pretending to be a 19th century bohemian—you should give it a try). 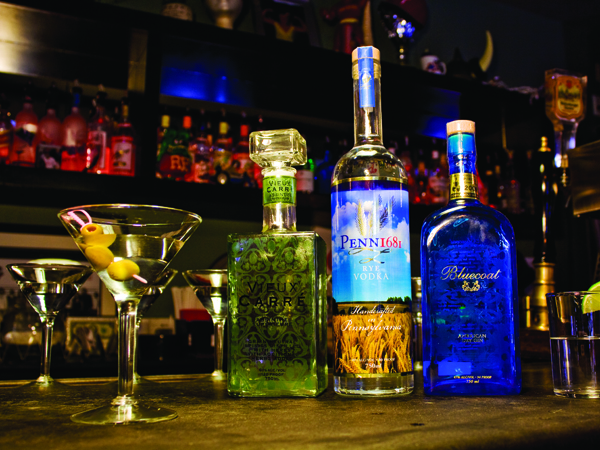 Bluecoat gin and Penn 1681 rye vodka are available at all state stores; Vieux Carré absinthe is available at Premium Collection stores like 1913 Chestnut St., 724 South St. and 1940 S. Christopher Columbus Blvd. Or, ask for them at your local watering hole.